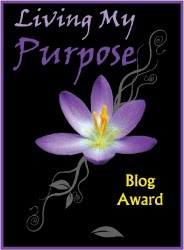 S.A. Larsen, Award-winning author of middle grade & young adult fiction: Do You Have PURPOSE?? Christina over on Christina's Journey gave me a brand-spanking new award!! It's beautiful. Thank you, Chris! Purpose, what's that really all about? As a mother, wife, and daughter, I guide, comfort, and love. As a writer, I do the same only in a different way. I feel compelled to give this award to a few of my writer friends who have either become CPs or have shared their writing journey with me on a personal level. Stina of Seeing Creative, Marcy (my 1st ever CP) of Mainewords, and Jen of A Day Into the Writer. Marcy over on Mainewords gave me this one. I love it! All that silver and of course black. Like the best color on the planet, ever!! I'm resorting back to my alter-ego: the rebel. Yeah, I've always love the color black, but when I was in school--Catholic school mind you--my mother thought it was inappropriate to wear anything black unless one was headed to a funeral. I loved black nail polish. Always wanted to wear it but she wouldn't let me. Wanted to paint my room black. Sure a bit morbid, but I'm cool with the undead and all such creatures. And hey, the nuns practically wore all black. 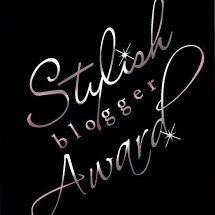 Anyway, so today I'm wearing black nail polish and a stylish new award! I'd love to pass these on in thanks to certain bloggers/writers but also to uplift and promote them. Hope you'll pay them each a visit if you don't already know them. C. Lee of TheWriteGame, Susan of Ink Spells, and Dianne of In High Spirits. I'd like to pass this on to LM (who is like the most versatile person I know), and Jen of Unedited. Seeing how I've done this one before, I thought I could get a bit silly with it and give you a visual of my junior high years. 1. Eyeglasses the size of toilet bowls on my face. 2. Said eyeglasses turned brown in the sun. BROWN. 3. Matted dark hair, which I probably hardly washed. 4. Absolutely, positively no curvaceous features. I was a stick figure. 5. Dork in a ridiculously ugly cheering uniform. Gosh, why didn't someone tell us??? Parent abuse. 6. Roller skates constantly on my feet (a product of the early '80s) with at least 10 to 12 rabbit's feet dangling from the laces. Why rabbit's feet, you ask? They were all my allowance afforded me out of the toy vending machine which was directly next to the cigarette vending machine. Congrats, my friends and Alleywalkers. Thank you for sharing in my writing journey to and beyond publication. Hearts to you All!! Tell me: what purpose does your writing have in your life? Congrats on your awards! And, I sympathize with the awkward jr. high images--I think that was the most painful two years of my life. Sheri - Thanks for the award! Love the peek at the junior high school you! I might be able to top you on one thing, though: My mom cut my hair -- and continued to cut it all through high school! I never saw the inside of a hair salon until I went to college! Congrats on the award. All of junior high and high school were so awkward for me so I can relate. My purpose in writing is to express my creative side and enjoy the process. Wow, look at all of those awards! You're going to have to get a new trophy case! Congrats! Ugh! I got glasses in eight grade, which were immediately placed by hard contacts which just came out. Thanks for the gorgeous award, Sheri. I love it! Jr High was a painful time in my life too. I was bullied both in Houston and in Canada. It was enough to make me want to move back to England where no one had been cruel to me. No wonder I was super shy. I wanted to be invisible after all of that. Fortunately HS was much better. Congrats on the awards! I was a rebel in black as well. I didn't go to Catholic school and I wore as much black as possible. My mom didn't agree with that one. It was an everyday battle. Junior high--kudos for sharing that one. I don't want to relive those years. Congrats on all those awards! We moved to a new state, where my teaching license isn't recognized, when my oldest was 6 months old. So I became a stay at home mom. And while I do not at all regret that decision, I am the kind of person who needs something just for me, too. And that's what writing gives me - a purpose beyond my kids. Good luck on our continued journey! Congrats on the awards! I love your BLACK background, it's a nice color. It is a color right? Thanks for the award! One of the best parts of my writing journey is playing a small part in other writer's journey's as well. And playing hockey does sound cooler than the cheer-fashion, but that's just me! Hey, if you were a cheerleader, you were cool, no doubt about it! Congratulations on all your awards. I agree with Shannon. You are worthy. 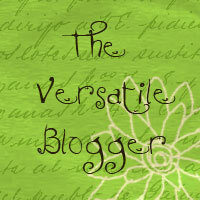 What an amazingly blog! I must admit I read quite a bit of YA books, but I've never attempted to write much in that genre. I really like the cover on your WIP and I'm looking forward to reading more from you. Congrats on your award! Which I love not only for its meaning but because Purpose was an AWESOME book! Ha ha, I remember roller skates and rabbit's feet too. Multi-colored rabbit's feet. Congrats on your awards! Congratulations on your awards. They are well deserved. wow, thanks sher :) and congrats on all your awards! Your jr high self sound like mine - not even remotely the girl we wanted to be! Aww congrats on your awards--you are made of all kinds of special! Ha - your junior high years sound a lot like mine. So glad that's over! Congrats on your awards, and you are most definitely worthy! And OMG, you sweet thing--I want to take middle school you and just squeeze you and your little rabbits feet! We could have been twins! I had huge glasses (why were those popular? ), braces, and was a twig. Oh and I was super tall so I towered over the boys. Congrats on the awards! That's great. Writing has always been a constant for me. Congrats on the awards. Love the visual of your Jr. high years. I don't think I really want to remember that time. I'm sure it wasn't pretty sight to see. LOL. Since you are Sooo AWESOME, I've nominated you for yet another blog award. LOL. You can pick it up on my blog. Congrats and Thanks for all that you do. It does make an impact.